What is money and how does it work? The usual answer; “I don’t know, but I’d sure like to have some”! About a year ago, I was at a dinner party with my wife and two other couples. There was an engineer, an artist/art seller, a pretty-well-known female comedian/writer who had written and published three books, a legal secretary and my wife and I. The conversation had turned to the overall rottenness of the economy, when the artist spoke up and said “If we’re so broke, why doesn’t the government print some money and just give everyone….oh, a million dollars. People would spend, the economy would churn, creating jobs, and unemployment would drop, sounds good to me.” Everyone laughed and said “Sounds good to me too.” After all, a million apiece could solve a lot of problems. So, let’s say tomorrow you wake up and the government has created a lot of money out of thin air and added some extra zeros to your bank account (In my case, it’d have to be a lot of zeros. )—and did the same for everybody else. You hop out of bed to celebrate, throw on your clothes and head out to fix the economy by spending, spending, spending. First, a great cup of coffee, a good breakfast and then, off to your favorite stores. But, you're not alone, everyone else in America has the same idea, why not, they're millionaires too. You think to yourself, “I bet the mall will be crowded, we better get going so we can fix America." Damn, it feels good to be so patriotic. There’s one big problem, however, the mall is closed, so is your favorite restaurant. How about McDonald's? Yep, it’s closed too. Why? What’s happened? Is it the apocalypse? Not exactly! Well, maybe it is, at least an apocalypse of the man-made variety—and the why of it should be obvious. Do you really believe that your average minimum wage worker, or even a well-paid one, is going to go and wait on you in order to serve your interests if they’re millionaires? Would you? Of course not! And so, everything would shut down, within a few days a cup of coffee at McDonald's would cost $100.00, and the “Dollar Store” would be renamed “The Thousand Dollar Store.” Inflation would've eroded your million dollars to a much smaller amount. Within a week, you’d be broke. Did you expect it to be otherwise? As silly as all of this sounds, it’s the way the government frequently works—and a lot of pretty smart people seem perfectly happy when it does. The government is about as close as any of us will ever get to an earthly god. It has the power of life and death. It can make you rich or poor, a freeman or slave, all with the swipe of a legislative pen. And, like all actions, there is a consequence, whether for God or government. A consequence that is indifferent to our deep convictions, but, is nonetheless, deeply rooted in our very complex human nature. That is why the government can’t endlessly borrow and spend money, no matter how good its intentions. It can have an earnest desire to eliminate suffering, ease the burden of the poor, and wish to elevate all mankind in the process. It can likewise desire to have peace through strength, building military muscle and firepower in order to protect us from the bad guys, but, if our essential human nature is misunderstood, and it frequently is, it can very quickly have the opposite effect. One way to give everyone a million dollars and, theoretically, keep inflation in check would be to give the government the power to regulate personal behavior. The Guv, as he/she will be called from now on, could put the money in your bank account, but, only with the stipulation that you show up for work and do your job. If you don’t, you don’t get the money. Of course, you’d still have the problem of inflation. Why? Because people could pay more for everything, and in a competitive market, more money means that people can drive up prices by simply paying more to get what they want. Back in the late 1990’s and early 2000’s the Federal Reserve slashed interest rates while Congress eased the standard for borrowing money, all with intent of helping the economy grow, which would put people back to work. With the Congress writing new laws and “The Guv” printing up endless piles of cash, banks could make low interest loans for credit cards, mortgages and auto loans—and the impact was immediate. This churned the economy, creating new construction, auto companies sold a lot of cars and housing prices went through the roof, which was great if you were selling a house, less so if you were trying to buy one. But, even then, “The Guv” was there to help. Before long, prices on houses doubled, and then tripled, and before you knew it, everyone was rolling in filthy lucre. Man that was easy! It was an economic miracle, similar to Jesus feeding five thousand people with a few fish and a couple of loaves of bread. The one part of the biblical story that tends to be forgotten is when a bunch of folk come back the next day and say to Jesus, “Hey, how about another miracle, we’re pretty hungry.” And, when Jesus doesn’t comply, they get pissed. “Sure, you did it once, but, what about today, we’re hungry—again”! Think about Greece or Ireland as a reference point. I guess that ole saying “Better to teach a man to fish if you don’t want him to become a permanent ward of the state or God” might apply–in the case of Greece and Ireland, a ward of the European Union—in the case of America, a ward of the banks, by means of “The Guv”. For the non-religious, think of the concept of "Natural Law" as articulated by deists like Thomas Hobbes and John Locke that undergirds the Constitution. If that’s still too religious, think about Einstein’s view of the universe, which is a deist one, mind you, but at least you can maintain the illusion of faithful atheism. Even Darwinian Fundamentalists seem to more or less understand this. 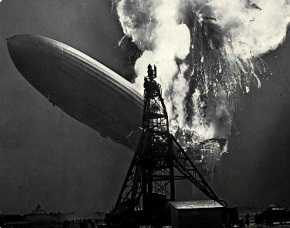 Anyway, housing prices rose like a hot air balloon going up, and up, and then, like the Hindenburg, burst into flames, a blazing bag of poisonous gas, crashing back to earth! Why? Because anything filled with hot, poisonous gas (which is a good description of most political thinking) will eventually blow up. It is, however, easy to be blinded by the benefit (cash in hand) while being oblivious to the cost (a whole bunch of personal or national debt). It is why freedom requires individual accountability—and why neither God nor government can answer all of your prayers without taking away your personal freedoms (I assure you, this isn't a reference to Calvinism). Unfortunately, as much as we might like to place our faith in “The Guv,” we should remember that it’s made up of people just like you and me. Even in the case of God, the principal remains the same. Freedom, or free-will, requires individual accountability. People must be allowed to fail, so they can learn to succeed. Once they’ve learned, usually the hard way, they’ll have “real” knowledge that can be passed on. This is the difference between blind faith and reasonable faith. Knowledge is always earned. True revelation is not a sudden epiphany disconnected from the past (Those who are ignorant of history are doomed to repeat it) but, a continuous process of growing in our understanding. Relationship, whether with “The Guv” or with God, may begin with a child-like trust, but should eventually turn into the kind of accountability that is inherent in all meaningful adult affiliations. One last point, just in case anyone should ask. Why didn’t prices on cars rise like prices on houses? Because, the number of cars could be increased by building more cars to meet the demand, causing prices to remain stable. By comparison, there’s only so much land on which to build houses and the process is considerably slower and more costly. For further reading study “Supply and Demand” and how prices are established by real human activity. Not by childish wish fulfillment. You’ll find, in the end, people spend their money based on their very personal priorities—and their priorities can be manipulated by external things like a government that prints too much money and lends it too cheaply in order to make it look like everyone is rich. If such principals are good enough for God, nature, natural law, the universe (fill in a deity, deist gods included), I’m pretty sure it’s good enough for the rest of us.